Designed to generate heat using waste wood by-product pellets, the KOZI Model 100 is a highly efficient, environmentally-friendly, economically priced unit. KOZI Pellet appliances are considered “clean burning” as they produce low environmental emissions and ash content. As a primary or supplemental heat source, KOZI Pellet Burners produce a large amount of heat while requiring little maintenance. Our products have been designed to meet the most stringent and rigid safety specifications in order to last a lifetime. The state-of-the-art MX Controller acts as a trouble-shooting guide. At a glance, this diagnostic system. will relay the operating status of your unit to ensure your safety and peace of mind. Wall-thermostat capable, standard air-ignition system, and our patient air wash screen saver guarantees that you will have the most up-to-date product on the market today! The Power Venting System eliminates any chances of back draft. The flexibility of burning either outside or room air allows for custom operation to suit any application. A convenient side mounted MX controller allows the owner to manually adjust the fuel feed rate and fan speed to suit individual needs for temperature control. An attractive matte black finish with a 24 K gold plate trim will accent the decor of any home. 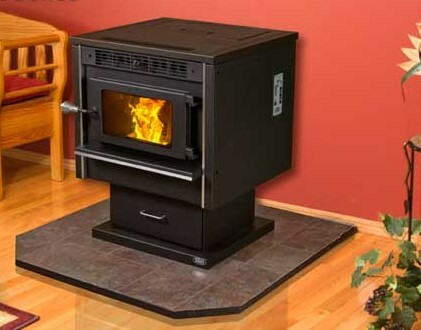 The KOZI Model 100 Pellet Stove is available with either a gold or black door. KOZI Pellet burners are warranted against poor workmanship and defective materials.